During the modern commemorative coin era, the United States Mint has issued 30 different gold coins. This has included 27 different $5 gold coins, two different $10 gold coins, and one bimetallic gold and platinum $10 coin, with each available in either proof or uncirculated versions. Across the various issues, mintages have covered an extremely wide range. Collector focus is often on the lowest mintage issues since these are generally the most difficult coins to track down and carry the highest premiums. 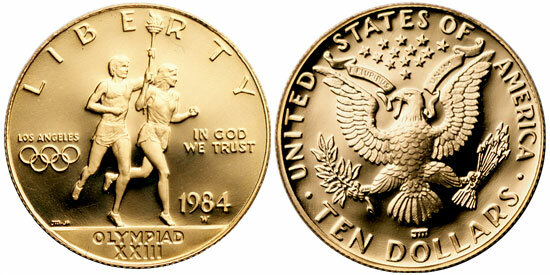 The first gold coin of the modern commemorative era was the 1984 Olympic $10 Gold Coin. The specifications were the same as the classic eagle or $10 gold piece with a composition of 90% gold, diameter of 27 mm, and weight of 16.718 grams, resulting in gold content of 0.4837 troy ounces. For this issue, the United States Mint produced a proof version with four different mint marks (P, D, S, and W) as well as an uncirculated version with W mint mark. The next commemorative gold coin would be issued to celebrate the centennial of the Statue of Liberty. The coins used specifications matching the classic half eagle or $5 gold piece, which would become the most frequently used going forward. Each coin was struck in 90% gold, with diameter of 21.6 mm and weight of 8.359 grams, resulting in gold content of 0.2418 troy ounces. The 1986 Statue of Liberty $5 Gold Coin was highly popular with the general public and sold out of the entire maximum mintage of 500,000 coins. which was divided between 404,013 proof coins and 95,248 uncirculated coins. Following the peak mintage achieved for the 1987 Constitution Bicentennial $5 Gold Coins of 651,659 proofs and 214,225 uncirculated coins, the clear trend for sales and corresponding mintages was down. 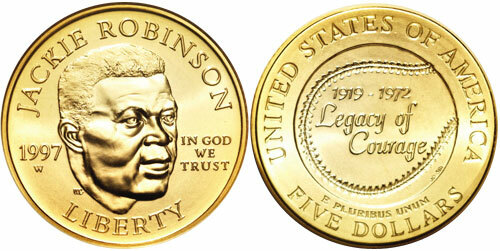 This culminated with a number of low mintage issues from 1995 to 1997. In 1995 and 1996, the US Mint released a flood of commemorative coins, led by the sixteen different designs to mark the Centennial Olympics held in Atlanta. This over abundance of new issues forced collectors to be more selective with their purchases or otherwise forgo certain issues, which exacerbated the existing trend towards lower sales. When the dust settled, the two uncirculated 1996 Olympic $5 gold coins had mintages below the 10,000 level. This was followed by the uncirculated 1996-W Smithsonian $5 gold coin which had an even lower mintage of 9,068, and one year later the 1997-W Jackie Robinson $5 Gold Coin, which had a mintage of 5,174. 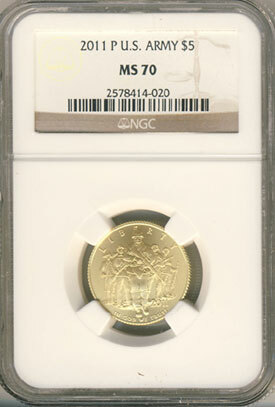 This issue still stands as the lowest mintage modern commemorative gold coin. In the following decade, mintage levels were generally higher, including larger numbers for some more popular issues like the 1999-W George Washington $5 Gold Coin, which featured a design by Laura Gardin Fraser. However, occasionally some subsequent issues would come in with low mintages. In each case, the low mintage issue was the uncirculated version rather than the proof, and the coin was only offered for sale by the US Mint individually as opposed to within a multi-coin set. The uncirculated 2001-W Capitol Visitor Center $5 Gold Coin and uncirculated 2000-W Library of Congress $10 Gold and Platinum Coin had mintages of 6,761 and 7,261, which still stand as the second and third lowest mintages amongst modern commemorative gold coins. Both of the coins joined earlier low mintage gold issues in commanding secondary market premiums. Last year, two commemorative gold coins concluded sales at historically low levels. A significant contributing factor may have been the higher issue price of the coins, which was a result of the higher market price of gold. In addition, another general trend of slower sales for most US Mint numismatic products seems to have emerged. The 2011-P Army $5 Gold Coin had last reported sales of 8,062, and the 2011-P Medal of Honor $5 Gold Coin had last reported sales of 8,251, making these the fourth and fifth lowest mintage issues. Despite displacing the status of earlier keys, secondary market prices for the two recent issues have remained only moderately above the issue price when last available for purchase from the US Mint. This is with the exception of certified examples graded MS70, which do command higher premiums. The relatively subdued secondary market response may signal a change in perception for for recently released low mintage gold coins. Collectors may justifiably carry the expectation that subsequent issues will have even lower mintages, continually undercutting the status of any recent release. As a case in point, this year’s uncirculated 2012-W Star Spangled Banner $5 Gold Coin has only sold 4,638 coins to date. Unless there is an unexpected surge in sales in the coming weeks, this issue will end up with a mintage well below last year’s issues and may even rival the mintage low of the 1997 Jackie Robinson Gold Coin. This article covers modern commemorative coins, which does not include the First Spouse Gold Coins. Technically, the First Spouse coins were authorized as a bullion series, although the US Mint markets and sells them as numismatic offerings. 2011-W Army $5 Gold was the proof version. Uncirculated was the 2011-P Army $5 Gold.